Phonotactic probability refers to the likelihood of a given set of segments occurring in a given order for a given corpus of transcriptions. For instance, blick is a phonotactically probable nonword in English, but bnick is phonotactically improbable. Words as well as nonwords can be assessed for their phonotactic probability, and this measure has been used in behavioural research ([Vitevitch1999] and others). In particular, the phonotactic probability of words has been correlated with their ability to be segmented, acquired, processed, and produced; see especially the discussion in [Vitevitch2004] for extensive references. One method for computing the phonotactic probability, and the current algorithm implemented in PCT, uses average unigram or bigram positional probabilities across a word ([Vitevitch2004]; their online calculator for this function is available here). For a word like blick in English, the unigram average would include the probability of /b/ occurring in the first position of a word, the probability of /l/ in the second position, the probability of /ɪ/ occuring in the third position, and the probability of /k/ occurring in the fourth position of a word. Each positional probability is calculated by summing the log token frequency of words containing that segment in that position divided by the sum of the log token frequency of all words that have that position in their transcription. The bigram average is calculated in an equivalent way, except that sequences of two segments and their positions are used instead of single segments. So for blick that would be /bl/, /lɪ/, /ɪk/ as the included positional probabilities. As with all n-gram based approaches, bigrams are preferable to unigrams. In the example of blick versus bnick, unigrams wouldn’t likely capture the intuitive difference in phonotactic probability, since the probability of /n/ and /l/ in the second position isn’t necessarily radically different. Using bigrams, however, would capture that the probability of /bl/ versus /bn/ in the first position is radically different. There are other ways of calculating phonotactic probability that don’t have the strict left-to-right positional assumptions that the Vitevitch & Luce algorithm has, such as the constraint-based method in BLICK by Bruce Hayes (Windows executable available on the Blick homepage, Python package available at python-blick on PyPi with source code available at python-blick on GitHub). However, such algorithms require training on a specific language, and the constraints are not computed from transcribed corpora in as straightforward a manner as the probabilities used in the Vitevitch & Luce algorithm. Therefore, PCT currently supports only the Vitevitch & Luce style algorithm. Phonotactic probability algorithm: Currently the only offered algorithm is the Vitevitch & Luce algorithm, described above. One word: The phonotactic probability of a single word can be calculated by entering that word’s orthographic representation in the query box. Spelling: Enter the spelling for your new word / nonword using the regular input keyboard on your computer. The spelling is how the word will be referenced in the results table, but won’t affect the calculation of phonotactic probability. Transcription: To add in the phonetic transcription of the new word, it is best to use the provided inventory. While it is possible to type directly in to the transcription box, using the provided inventory will ensure that all characters are understood by PCT to correspond to existing characters in the corpus (with their concomitant featural interpretation). Click on “Show inventory” and then choose to show “Consonants,” “Vowels,” and/or other. (If there is no featural interpretation of your inventory, you will simply see a list of all the available segments, but they will not be classifed by major category.) Clicking on the individual segments will add them to the transcription. The selections will remain even when the sub-inventories are hidden; we allow for showing / hiding the inventories to ensure that all relevant buttons on the dialogue box are available, even on small computer screens. Note that you do NOT need to include word boundaries at the beginning and end of the word, even when the boundary symbol is included as a member of the inventory; these will be assumed automatically by PCT. Frequency: This can be left at the default. Note that entering a value will NOT affect the calculation; there is no particular need to enter anything here (it is an artifact of using the same dialogue box here as in the “Add Word” function described in Adding a word). 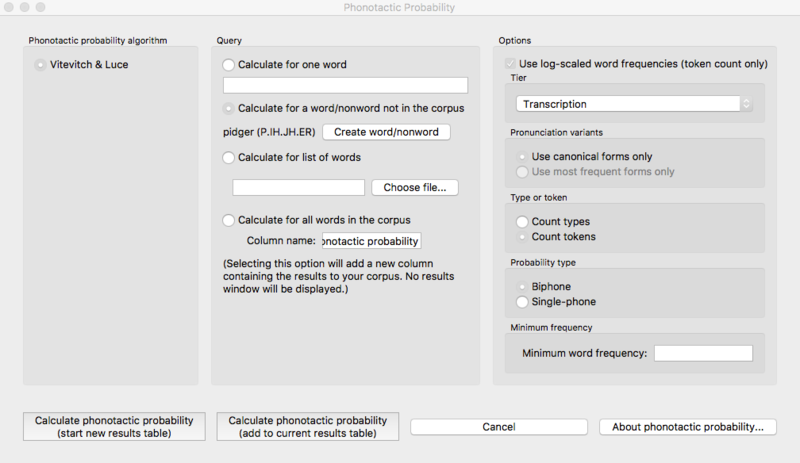 List of words: If there is a specific list of words for which phonotactic probability is to be calculated (e.g., the stimuli list for an experiment), that list can be saved as a .txt file with one word per line and uploaded into PCT for analysis. If words in the list are not in the corpus, you can still calculate their phonotactic probability by entering in the spelling of the word and the transcription of the word in a single line delimited by a tab. The transcription should be delimited by periods. Whole corpus: Alternatively, the phonotactic probability for every current word in the corpus can be calculated. The phonotactic probability of each word will be added to the corpus itself, as a separate column; in the “query” box, simply enter the name of that column (the default is “Phonotactic probability”). Log scaling: If token frequencies are being used, the default is to log the frequencies first (following Vitevitch and Luce, described above). PCT takes natural logs, i.e., logs with base e, but note that because of the calculation involved, the choice of log makes no difference to the final answer (the calculation involves dividing the log frequency of words with the sound in question in the given position by the log frequency of all words that have any sound in the given position, so the bases of the logs cancel each other). One can choose not to log-scale the frequencies at all if one prefers. Note that this is an option only for token frequencies; if type frequencies are being used, each word has a type frequency of 1, and the logarithm of 1 is 0, regardless of the base; hence, log-scaling type frequencies would make all the calculations meaningless. Note that if log-scaling of token frequencies is used, then in the event that a word has a token frequency of 1, this is first replaced in the calculation with 1.00001 to avoid any problems with division by zero. Tier: Phonotactic probability can be calculated from transcription tiers in a corpus (e.g., transcription or tiers that represent subsets of entries, such as a vowel or consonant tier). Pronunciation variants: Specify whether phonotactic probability should be calculated based on the canonical pronunciations of each word or the most frequent pronunciations (which may not be the same). See more in Pronunciation Variants. Type vs. token frequency: Specify whether phonotactic probabilities should be based on word type frequency or token frequency. The original Vitevitch & Luce algorithm uses token frequency. As discussed above in (3), token frequency defaults to using the log frequency when calculating probabilities. Probability type: Specify whether to use biphone positional probabilities or single segment positional probabilities. Defaults to biphone. Results: Once all options have been selected, click “Calculate phonotactic probability.” If this is not the first calculation, and you want to add the results to a pre-existing results table, select the choice that says “add to current results table.” Otherwise, select “start new results table.” A dialogue box will open, showing a table of the results, including the word, its phonotactic probability, the transcription tier from which phonotactic probability was calculated, whether type or token frequency was used, whether the frequency was log-scaled, whether the algorithm used unigram or bigram probabilities, and the phonotactic probability algorithm that was used. If the phonotactic probability for all words in the corpus is being calculated, simply click on the “start new results table” option, and you will be returned to your corpus, where a new column containing the phonotactic probability for each word has been added automatically. Saving results: The results tables can each be saved to tab-delimited .txt files by selecting “Save to file” at the bottom of the window. If all phonotactic probabilities are calculated for a corpus, the corpus itself can be saved by going to “File” / “Export corpus as text file,” from where it can be reloaded into PCT for use in future sessions with the phonotactic probabilities included. To return to the function dialogue box with your most recently used selections, click on “Reopen function dialog.” Otherwise, the results table can be closed and you will be returned to your corpus view. For further details about the relevant classes and functions in PCT’s source code, please refer to Phonotactic probability.